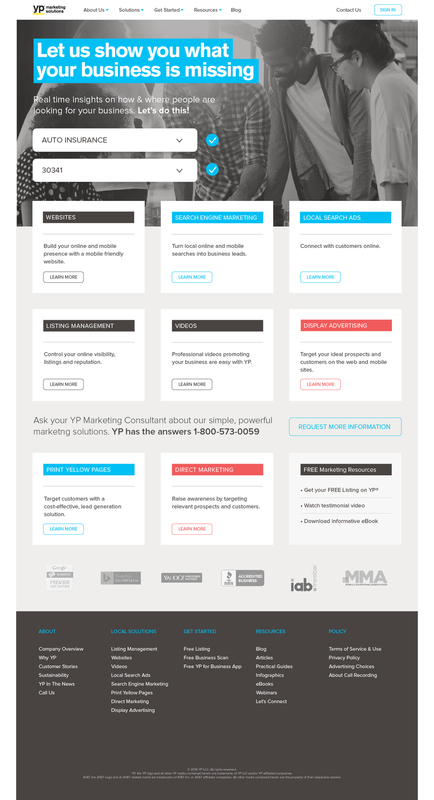 YP needed to show the power of their products by giving insights directly from the homepage. Creating a solutions based selling procedure. Project included concept development, website prototypes and cooperation with data team to understand what could be done with the YP data to provide insights for the customer and provide sales with lead generation. User chooses a vertical industry which best matches their business type. Quick location targeting by entering the zip code and accessing the data. Once both field of information are complete, the website would then show completion and begin accessing data for load of next page. Data is served showing the location of searches for their type of industry and how many searches they are missing for not utilizing a digital marketing strategy.